Price: $1,149 (approx. $800 street). 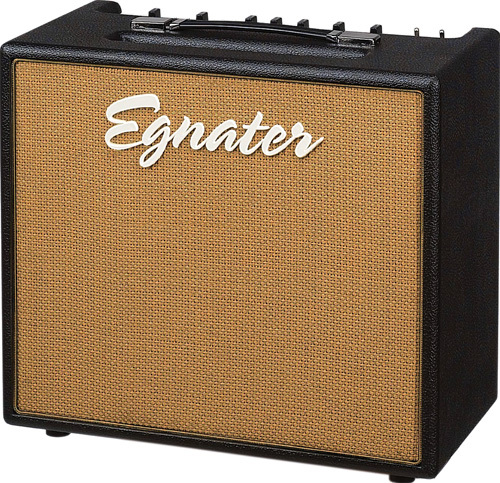 Egnater has just amplified its Tweaker line with a new 40-watt, two channel, 1×12 combo. This amp has a Celestion Elite GH-50 speaker in a half-closed, birch-plywood cabinet and weighs a portly 53 pounds – though as many tube enthusiasts know, more weight often adds up to more tone. Let’s put this little chunker to the test. The Tweaker 40 sports two 6L6 power tubes and a trio of 12AX7 preamp tubes. Before we get to the extensive tone-shaping controls in the pre-amp, let’s look at the back. The combo is unusual in that most of its rear-panel jacks face downward and are in a recessed cavity. In that spot are the A.C. jack, buffered effects loop with level, footswitch jack, and speaker-cabinet output. Aesthetics include a black Tolex skin with a cane grille and the Egnater logo. It’s very attractive and has a Bluesbreaker vibe, especially with the top-facing control section. In case you were wondering, the “tweak” in the Tweaker 40 is an extensive array of mini-switches that work to complement the three-band EQ that services both channels. Each channel has its own Gain and Master controls with mini switches for British, American, and AC (i.e., Vox-like) tone colors. The channels each have four other mini “voicing” switches, covering tone tweaks like Tight and Bright, Vintage and Modern, Clean and Hot, and Mid Cut. Combined with the footswitch that picks channels and effects on/off, it gives the player has a huge array of tonal colors to choose from. Plugging in with a Strat, Les Paul, and an Ibanez archtop, I was able to run the gamut of tones from A to Z, clean to shred dirty. There are plenty of fat, clean tones here – the Tweaker has surprising girth for such a small amp – and lots of dirty tones. Pop the mini-toggle from Clean to Hot and suddenly, you have some serious, hi-gain metal tones. To stoke the party further, I plugged the speaker-out jack into a 2×12 extension cabinet and got some hellaciously big tones. It’s difficult to avoid cracking a smile at the sounds that emanate from the Tweaker. Ultimately, you shouldn’t let the Tweaker’s diminutive size fool you. The amp’s weight is an indication of its quality construction and a big honkin’ transformer. The combo also has a wider cabinet, which helps push air (and tone), and it delivers fat, Cream-era tones when paired with a humbucker-equipped guitar. This Egnater delivers 40 loud watts, certainly enough to be gig ready. Add an extension cab, and look out world!